Below is a hypothetical example of a 1031 exchange investor that purchased DSTs with loans on them. It exemplifies the risk of debt, and the potential benefits of remaining as debt free as possible when investing in DSTs. James had $500,000 from the sale of an apartment duplex he owned for over 25 years. He owed $150,000 in capital gains and recapture of depreciation, so he decided to defer his taxes by conducting a 1031 exchange into DSTs. Despite not having a requirement to take on debt, James’s financial advisor had him exchange into a DST with 50% loan to value. He assured James it was ok because the DST sponsor company was well known and had been around for years, it was a modest level of debt, that the appreciation potential would be higher with the debt and that debt can provide some tax sheltering. James invested in the DST and took on $1M in property, $500,000 of it being debt. The property was sold 4 years later at a major loss due to the loan coming due. The advisor did NOT educate James on the risk of debt, and how debt can put the asset in precarious situations, potentially forcing the sponsor to sell at inopportune times to prevent foreclosure, distributions being lowered and/or being stopped altogether. Upon the sale of the property, James only had $250,000 of his original $500,000 invested after paying off the debt. The unfortunate problem is that James now needs to conduct another 1031 exchange into $750,000 in total property value (per the IRS 1031 exchange rule of purchasing equal or greater value in replacement property as you had in the property you sold) in order to prevent a taxable event and pay taxes out of pocket. James at this point found himself in a precarious situation of needing to exchange into properties that had at least a 67% loan to value in order for him to complete his 1031 exchange, which higher loan to value properties are difficult to find in today’s market, unless he wanted to add cash to the exchange or purchase an interest into a DST with 80%+ Loan to Value called a Zero Coupon DST (zero coupon DST properties have no cash flow to the investors as 100% of the income from the tenant is paid to the lender). James now with the help and guidance of his financial advisor, receives potentially no cash flow on a portion of his equity that had to go into the Zero Coupon DST, has half of the amount of equity he had originally and went from an all cash debt free 1031 exchange situation to a 67% loan to value 1031 exchange situation. Investors should be careful if a financial advisor recommends that they purchase DST investments with debt on them if they have already paid off their properties and own them free and clear. The risks of debt are very real and can potentially be exasperated if things don’t go as planned with the DST property. Although almost all real estate backed investments contain risk and have no guarantees, James’ outcome may have been more positive for him if his advisor had recommended the All-Cash/Debt-Free DST offering. If that had been James’ choice, the DST may not have sold the property at an inopportune time. The DST could have chosen to hold the property, since there was no loan at maturity forcing a sale or refinance; and the DST could in that case, continue to distribute any available cash flow as defined in its trust agreement. This is hypothetical example and may not be representative of future situations. Past performance does not guarantee or indicate the likelihood of future results. There are material risks associated with investing in real estate, Delaware Statutory Trust (DST) properties and real estate securities including illiquidity, tenant vacancies, general market conditions and competition, lack of operating history, interest rate risks, the risk of new supply coming to market and softening rental rates, general risks of owning/operating commercial and multifamily properties, short term leases associated with multi-family properties, financing risks, potential adverse tax consequences, general economic risks, development risks and long hold periods. There is a risk of loss of the entire investment principal. Past performance is not a guarantee of future results. Potential cash flow, potential returns and potential appreciation are not guaranteed. For an investor to qualify for any type of investment, there are both financial requirements and suitability requirements that must match specific objectives, goals and risk tolerances. Diversification does not guarantee returns and does not protect against loss. This material does not constitute an offer to sell nor a solicitation of an offer to buy any security. Such offers can be made only by the confidential Private Placement Memorandum (the “Memorandum”). Please be aware that this material cannot and does not replace the Memorandum and is qualified in its entirety by the Memorandum. Past performance is not a guarantee of future results: potential cash flow, potential returns, and potential appreciation are not guaranteed in any way and adverse tax consequences can take effect. Real estate is typically an illiquid investment. Please read carefully the Memorandum and/or investment prospectus in its entirety before making an investment decision. Please pay careful attention to the “Risk” section of the PPM/Prospectus. 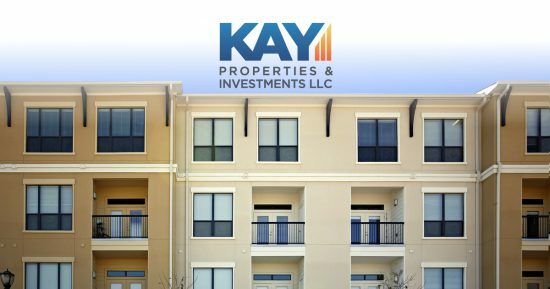 All photos are representative of the types of properties that Kay Properties has worked with in the past. Investors will not be purchasing an interest in any of the properties depicted unless otherwise noted.